La región naturalmente hermosa de Mavrovo puede ser difícil de visitar desde Skopie sin tener que alquilar un automóvil. En esta visita de un día completo, visite con facilidad y aprenda sobre el área con un guía. En esta visita de un día completo, visite con facilidad y aprenda sobre el área con una guía. Visite los monasterios de San Jovan Bigorski y Rajcica y admire las estalactitas y estalagmitas en la cueva Sharko. Disfruta de un almuerzo tradicional macedonio. Did the Mavrovo tour on Tuesday and it was awesome. The Mavrovo region is very beautiful. I was amazed by the mountains, villages and forests. Its a special place that I hadnt experienced before. The driver Daniele and guide Suzana are very pleasant company. They know all the great spots to take pictures and enjoy the view. The guide Suzana really knows a lot about the region and it's history and it was very nice to hear the stories. Can recommend this day trip to everyone. This tour was one of the highlights while recently visiting Macedonia. The tour guide, Suzanna, and driver, Danielle, were both tremendous. They went out of their way to show me some spectacular scenery and make sure I got the most out of the day. It was genuinely a lot of fun. 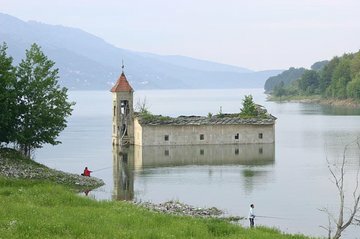 Mavrovo deserves to be more well known and is chock full of interesting landscapes and villages. If you want a relaxing day outside of Skopje, you can't do better than this.